Now that the fate of the KIN has been determined, steps are being taken by retailers to clear inventory. 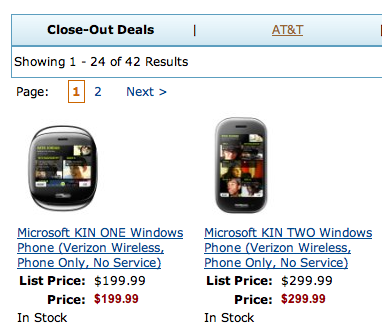 Look no further than Amazon and you’ll see the KIN One and KIN Two are available for $199 and $299 without a contract. The pair appear in Amazon’s Close-Out Deals. With their fate sealed, we cannot recommend anyone pick up either of these unless they want an ever so brief slice of phone history.